Embark on an exciting journey into some of India's most famous wildlife destinations on this holiday; Explore the wilderness of Ranthambore and Kanha, watch out for the Tigers of Bandhavgarh and visit Bharatpur, one of India's best bird sanctuaries. Round off your tour with a visit to the magnificent Taj Mahal. Your Indian wildlife tour to the jungles of North India begins in New Delhi. On arrival in New Delhi Airport, you will be met by our representative, who will help you get to your hotel. 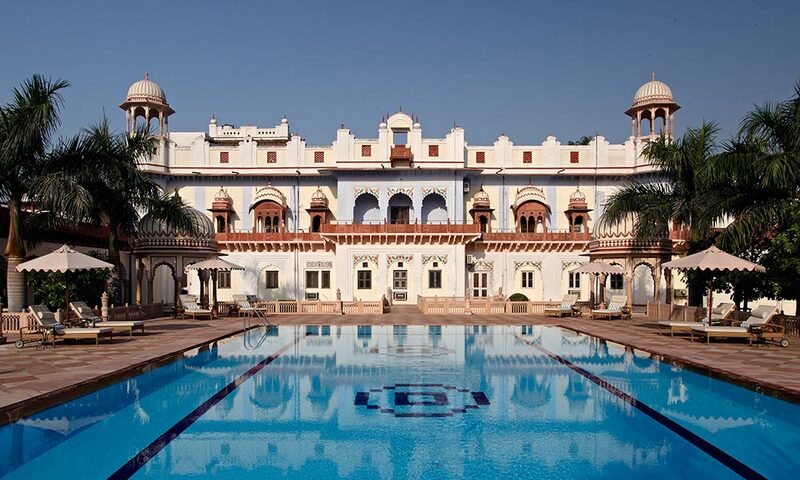 Spend the day relaxing in the hotel or go out and explore the city of Delhi. Delhi, the capital city of India, is one of the largest and fastest growing metropolises in the world. It is a bustling city, ever growing and moulding itself with the times. The city has a colourful history which is embodied in its monuments, forts and historical places. A visitor can choose to sample the culture of the city in its vibrant markets or taste the Indian cuisine in its numerous eateries. Delhi has something to offer everyone! We advise you to get adequate rest today, as we have action packed days ahead! Today after breakfast, we will travel to Jaipur (approx 4 hours drive). After lunch, you are free to spend the day as you choose. Jaipur, also known as the ‘pink city’ is India’s first planned city and the capital of the Indian state of Rajasthan. An erstwhile princely state, Jaipur has a rich history and heritage. The forts and monuments in the city like the Jantar Mantar a UNESCO World Heritage Site, Nahargarh Fort, Hwaha Mahal, Amber Fort, Jal Mahal and several others make the city a favourite destination for tourists worldwide. After an early breakfast, we will drive for about 3 hours to reach Ranthambore National Park, our first wildlife destination! A game drive into Ranthambore National Park is scheduled for after lunch, and we will explore Ranthambore till dusk. Ranthambore National Park is one of the largest and most famous national parks in north India. It is named after the historic Ranthambhore fortress that is located inside the park. Ranthambore is situated in the Sawai Madhopur district of southeastern Rajasthan, about 180 km from Jaipur. The park covers an area of 392 sq km (square kilometres). Bound to the north by the Banas river and to the south by the Chambal river, Ranthambore lies at the edge of a plateau. There are several lakes here and it is home to a variety of plants and animals. However, Ranthambore's pride is the population of Tigers that inhabit the park and it is also the site of one of the largest banyan trees in India. The next two days will see us starting out early for morning Ranthambore tiger safaris. It is famous for its Tiger population, and is considered to be one of the best places in the country to observe these magnificent animals. In addition to the Tiger, the park is home to the Leopard, Striped Hyena, Sambar Deer, Chital, Nilgai, Common or Hanuman Langur, Macaque, Jackal, Sloth Bear, Blackbuck, the Indian Wild Boar, Chinkara, Common Palm Civet or Toddy Cat, Desert Cat, Fivestriped Palm Squirrel, Indian Flying Fox, Indian Fox, Long-eared Hedgehog, Ratel (Honey Badger) and many more. The amphibian species residing in the park consist of the Common India Toad and the Common Frog. We return to the lodge for breakfast. You can relax till after lunch. We will then set out on an afternoon game drive in Ranthambore. Keep a look out on the forest floor as the park has an impressive list of reptiles species residing in the park such as the Snub Nosed Marsh Crocodile, Desert Monitor Lizard, Tortoise, Banded Krait, Cobra, Common Krait, Ganga Soft Shelled Turtle, Indian Python, North Indian Flap Shelled Turtle, Rat Snake, Russell's Viper, Saw-scaled Viper and Indian Chamaeleon. We return at dusk after an eventful day at the park. If time permits, we may even visit Ranthambore Fort. Our day starts with an early breakfast, after which we drive for about 5 hours to reach the famous Keoladeo National Park. Formerly known as the Bharatpur Bird Sanctuary, it is situated in Rajasthan, India. It is a World Heritage Site and covers an area of 28.73 sq km (square kilometres). The sanctuary was created 250 years ago and is named after a Keoladeo (Shiva) temple that lies within its boundaries. Keoladeo was declared a protected sanctuary in 1971. It later became a bird sanctuary and is today a national park. Keoladeo is home to thousands of rare and highly endangered birds. Migratory birds such as the Siberian crane come here during the winters. It is also a major tourist center, and scores of ornithologists visit the park in the hibernal season. You can spend the rest of the day relaxing or exploring your surroundings. Today, we will leave early in the morning for birdwatching in Bharatpur Bird Sanctuary. This park, as you may soon discover, is a birdwatcher's paradise and is famous for its resident as well as migratory birds. These include Geese, Ducks, Eagles, Hawks, Shanks, Flycatchers, Buntings, Larks, Pipits, Cranes, Pelicans, Stints, Wagtails, Warblers and Wheatears. Apart from its population of birds, Keoladeo also houses the Sambar, Chital, Nilgai and Wild Boar. Bharatpur, a UNESCO World Heritage Site, can be explored using a quaint rickshaw, on foot and by boat. We return to the lodge for breakfast. You are free until after lunch, when we will set out once again to explore the park. After breakfast, we travel to Agra via Fatehpur Sikri. We will be stopping here for a guided tour of this famous World Heritage Site. Fatehpur Sikri was once the capital of Mughal emperor Akbar’s massive empire. You can spend the afternoon in Agra going on a guided tour of the magnificent Taj Mahal. Agra is synonymous with the Taj Mahal, a beautiful mausoleum built by Mughal emperor Shah Jahan. 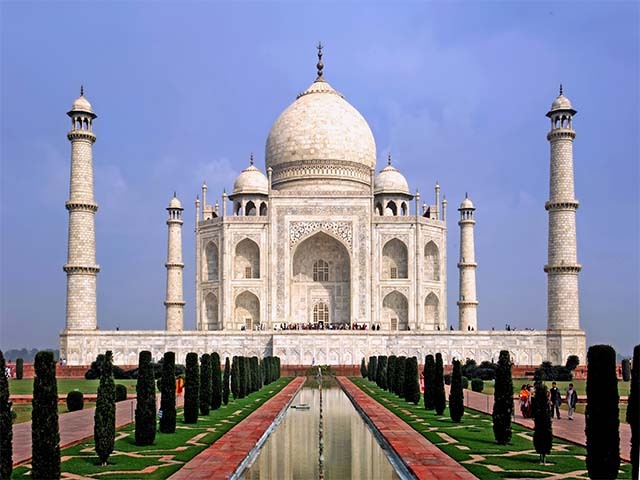 It was built as a symbol of love for his wife, Mumtaz Mahal and is counted among the Seven Wonders of the World. It is also a UNESCO World Heritage site and took a mind boggling 21 years and thousands of artisans to complete. Get mesmerized by the splendour of this exquisite monument. If you have time, visit the Agra Fort and Sikandra, Akbar’s tomb. Visit the quaint markets of Agra and taste the famous sweet, Agra Petha. In the morning we will visit the Agra Fort. The rest of the day can be spent relaxing till it is time to board the evening train to Umaria (Kalinga Utkal Express Train). We reach Umaria railway station early in the morning, from where we will drive for about one hour to reach Bandhavgarh National Park. You can spend the rest of the morning relaxing. After lunch, we will go on a Bandhavgarh safari and your day ends at dusk by the bonfire. Bandhavgarh National Park is one of the most popular national parks in India. It is located in the Umaria district of Madhya Pradesh, India. It was declared as a national park in 1968 and covers an area of 105 sq km (square kilometres). The park has an interesting myth surrounding it; in fact it derives its name from the most prominent hillock in the area, which was said to have been given by Lord Rama to his brother Lakshmana, to help him keep a watch on Lanka (Sri Lanka). Hence the name Bandhavgarh, which in Sanskrit means 'Brother's Fort'. 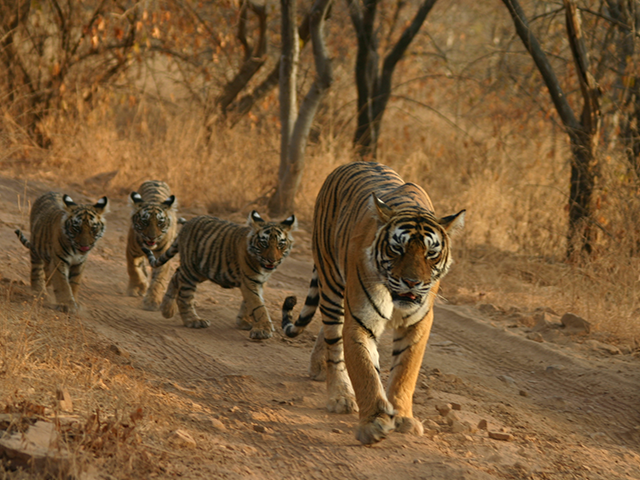 The density of the Tiger population at Bandhavgarh is one of the highest in India. The park has a large breeding population of Leopards, and various species of Deer. Your tryst with Bandhavgarh continues over the next two days. We begin these two exciting days with early morning safaris in Bandhavgarh National Park and return to the lodge for breakfast. During the safari you will get a chance to see the park’s varied wildlife including Spotted Deer, Sambar Deer, Langurs, Red Faced Monkeys, Jungle Cats, Bengal Foxes, Mongooses, Striped Hyenas, Bandicoot Rats, Asiatic Jackals, Wild Boars, Nilgai, Chausingha, Chinkara, Indian Bison and Asian Elephants. You can relax until after lunch, when we will head into the wilderness once more till dusk on evening game drives in Bandhavgarh. The park is also popular for birdwatching and some of the common birds in the park are Little Grabe, Egret, Lesser Teal, White-eyed Buzzard, Black Kite, Crested Serpent Eagle, Black Vulture, Egyptian Vulture, Common Peafowl, Red Jungle Fowl, Dove, Parakeet, Kingfisher, Indian Roller and the Indian Peacock. Today, after an early breakfast we head for Kanha National Park (approx 6 hours drive). We will be spending the next 3 nights here. Lunch will be served after checking in at the lodge. This will be followed by an afternoon game drive in Kanha, from which we return at dusk. We advise you to get enough rest today as the next two days begin early and are packed! Our exploration of Kanha National Park will continue over the next two days. We begin both these exciting days with early morning Kanha safaris and picnic breakfast. Dawn is an ideal time to sight animals and for birdwatching. Some of the bird species found here include Storks, Teals, Pintails, Pond Herons, Egrets, Peacocks, Peafowl, Jungle Fowl, Spur Fowl, Partridges, Quails, Ring Doves, Spotted Parakeets, Green Pigeons, Cuckoos, Rollers, Bee-eaters, Hoopoes, Drongos, Warblers, Kingfishers, Woodpeckers, Finches, Orioles, Owls and Flycatchers. A long drive into the forest will allow you to observe the wildlife at close quarters. We return to the lodge for lunch and relax till it’s time to head into the wilderness once more until dusk on evening game drives. Photographers have a great opportunity to capture the beautiful landscapes and wildlife in the park. 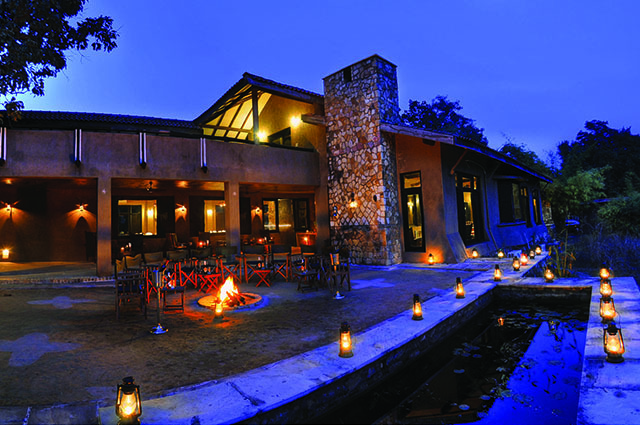 We will set out on the final game drive of the tiger safari holiday and return to the lodge for breakfast. We will then drive to Nagpur airport to catch a flight to Delhi (approx 6 hours drive). Our representative will meet you at Delhi airport and help you get to your hotel. The rest of the day can be spent relaxing. If there is time, you can spend the final day exploring Delhi before heading for the airport to catch your flight back home to end your India wildlife holiday.